We've been having so much fun playing with St. Patrick's Day rainbows and shamrocks! Holidays are just fun when you have a 2 and 3 year old. Today I have two quicky tips and tricks for your St. Patrick's Day season. These aren't mind blowing or overly literate activities, but they are fun! Do you have any leftover heart stickers from Valentine's Day? Why not make them into shamrocks for St. Patrick's Day? 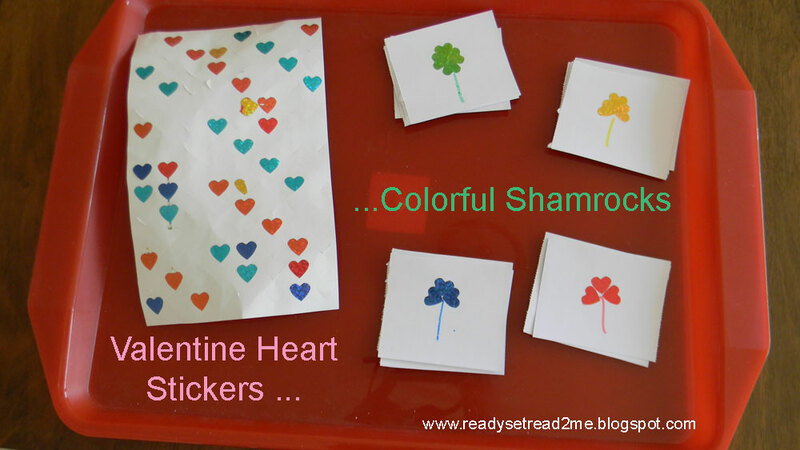 I took this sheet of leftover Valentine hearts and made colorful clover cards. We used these cards for sorting and patterning. You know the old rhyme, "Peter Piper printed a peck of shamrock peppers..." No. No. That's not right... Anyway, apparently these are not anything new. After I first saw them on Pinterest-- linked to this article on St. Patrick's Day crafts--- I have seen them EVERYWHERE. But let me be honest, they were new to me! I just cut off the bottom of a pepper and they stamped in green paint. It's a pretty un-messy way to paint... until Tyson decided to eat the pepper! Tyson is 2 and Logan is 3-- but if you meet him, he will quickly tell you, "I'm almost 4". This was an activity they both enjoyed. Readers, I need your help on this tip. I did not have any luck when searching for great books about St. Patrick's Day for the boys. I found a few books that had a few informative facts, but I didn't find any books that I was excited to share! There have to be some great St. Pat's Day books. Some of you have been in the preschool business longer than me, would you be willing to share your favorite St. Patrick's Day books? Even if we can't locate a copy until next year, I'll be ready to go by then! If you have a review post of the book, share the link. I'd love to be able to pin the book to my spring pinterest board. Speaking of Pinterest, are we connected on Pinterest? You can find me at http://pinterest.com/bookblogmomma. Where can I find you? I am actually a (part) Irish girl, so we will probably hit a parade and do something fun for St. Patty's I hope you have a fun day with your families as well! What fun! I need to take out paint and veggies to craft with. I had a terrible time finding Saint Patrick's Day books too! Children's book authors, if you want to fill a need, write one of these! But one book I found that the kids liked was The Leprechaun's Big Pot Of Gold, by Patricia Eubank. It is a board book, but there is a pretty decent story inside. Its about a greedy leprechaun who is grumpy because he cannot find his gold. When he makes friends with a dog and a kitten, he realizes he doesn't need gold to be happy! Another book I found was The Night Before Saint Patrick's Day, by Natasha Wing. You've probably seen that one since its pretty well-known, but its about two kids who try to trap a leprechaun, and its written in the rhyming style of The Night Before Christmas. I hope that helps! Tim O'Toole and the Wee Folk by Gerald McDermott- it was really fun, but a long story for older older preK's and elementary kids I think. Also my friend Vanessa at www.sillyeaglebooks.com had lots of great St. Pats books to recommend. Tomie de Paola has some great Irish titles and some St. Pats books that are lots of fun.